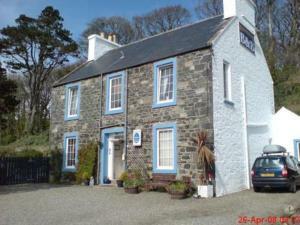 Rhins of Galloway offers a garden setting overlooking Loch Ryan. It is situated between the 2 ferry ports of Stranraer and Cairnryan. The guest house is just 5 minutes' drive from Stranraer's ferry terminal and only a one-minute drive from Cairnryan. It is well-positioned for the Stena Line ferries to Belfast and the P&O ferries to Larne. Rhins of Galloway is just a short drive from the area's shops and eateries, whilst offering the peace and quiet of a rural location. In a spacious and relaxed setting, all of the high-quality en suite accommodation is comfortable, clean and well-presented. Breakfast is freshly prepared and made to order. A limited snack menu is available until 8pm, served in the room or the lounge. Various dining options are available locally. On the outskirts of the town. This friendly, family-run inn/bed and breakfast offers a mix of well-equipped rooms and en suite chalets, and has a reputation for hospitality that brings back valued guests year after year. The establishment will provide the comfort, facilities and welcome to ensure you enjoy Stranraer and the surrounding area. With a family license and a perfect location, the staff hope that you too will become a regular visitor. Situated right in the heart of Stranraer, the Inn/bed and breakfast is a perfect base for your holiday. The great location means that you are just a short walk from all the attractions, shopping and delights that the town has to offer. This family-run guest house is ideally suited for those exploring the local area, or for travellers to Ireland, and is conveniently located for the ferry terminal and Ryan Leisure Centre. Cross Haven is a beautiful Victorian villa situated in its own private garden. It was formerly used as a convent, and has retained its peaceful atmosphere. Cross Haven offers good quality bed and breakfast accommodation. Spacious twin and double en suite rooms feature a TV, DVD player and hospitality tray. A ground floor room is available which may be suitable for guests with mobility difficulties. Close to Stranraer's town centre and ferry port, this family-run bed and breakfast is a stone-built Victorian building with fine woodwork and ceilings. Fernlea Guest House offers a warm welcome and a friendly atmosphere. 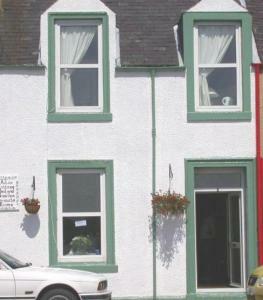 Decorated to a high standard, the guest house has 4 stars from the Scottish Tourist Board. Each room is en suite and includes free Wi-Fi access. Local attractions include Logan Botanical Gardens, the Southern Upland Way and Portlogan (home of the BBC TV series Two Thousand Acres of Sky). Guests can use Fernlea's private car park for free. Ideally situated on Stranraer seafront, just 5 minutes walk from the town centre, train station and ferry terminal, this family-run guest house with free Wi-Fi is conveniently located for an enjoyable stay. Lakeview Guest House has been awarded a 3-star guest house rating by the Scottish Tourist Board and a very warm welcome awaits you at this bed and breakfast accommodation. Of the guest house's rooms, 4 are en suite and 2 overlook Agnew Park and the picturesque Loch Ryan. The owners pride themselves on the full Scottish breakfast that is served each morning in the dining room that overlooks Loch Ryan. The guest house is just 5 minutes' walk from shops and restaurants. As Stranraer is a busy town it is advisable that you book in advance, and the owners of the guest house will be happy to do this for you. This traditional inn offers free Wi-Fi and comfortable, good value accommodation, a 5-minute walk from the town centre. The ferry terminal is a 3-minute drive away. Each spacious en suite room features satellite TV, a DVD player and cosy beds. A continental breakfast is available and includes a selection of fresh fruit. Enjoy a drink in the welcoming bar, with 2 large TVs, weekly live entertainment and a pool table. Relax in the beer garden or watch the 9-ft (2.75 metre) HD TV in the lounge. The Swan Inn offers free parking and a complimentary transfer service from all local arrival points. 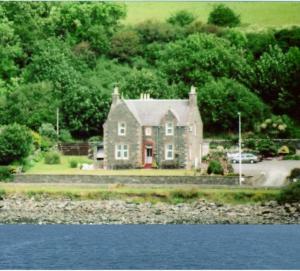 With free parking, free Wi-Fi and spectacular views overlooking the shores of Lochryan, this unique 4-star Victorian bed and breakfast is between the ferry ports of Stranraer and Cairnryan. Balyett Bed and Breakfast is just a 4-minute drive from Stranraer's ferry port and only a 5-minute drive from Cairnryan - ideal for the Stena Line ferries to Belfast and the P&O ferries to Larne. Balyett offers beautifully decorated spacious rooms. All match the traditional decor of this Victorian home. You can sit in the garden or relax in the lounge by the log fire with a drink, all whilst watching the ferries go by. On the shores of Loch Ryan, The Merchants House is situated in the picturesque village of Cairnryan. With free parking and free Wi-Fi, there is also a traditional Scottish restaurant. The colourful bedrooms are individually decorated and feature tea and coffee facilities, a hairdryer and a TV. Some rooms have a modern en suite bathroom. The Merchants House Restaurant serves a varied menu using fresh, local produce, and offers views across the loch to Wig Bay. The cosy bar has a collection of Scottish whiskies, and full cooked breakfasts are served daily. 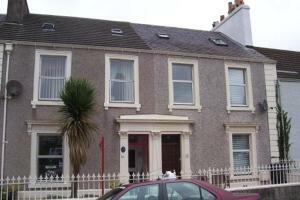 The Merchants House is just 500 metres from Cairnryan Ferry Terminal, offering crossings to Larne. Surrounded by beautiful countryside, the guest house is a 40-minute drive from Galloway Forest Park.